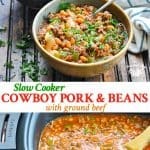 Slow Cooker Cowboy Pork and Beans are loaded with ground beef, navy beans, vegetables, and a tomato-based sauce for an easy dinner recipe or a popular potluck side dish! 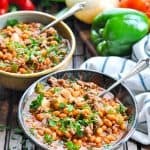 Sweet, savory, tangy and satisfying, Slow Cooker Cowboy Pork and Beans are loaded with ground beef, navy beans, vegetables, and a tomato-based sauce. 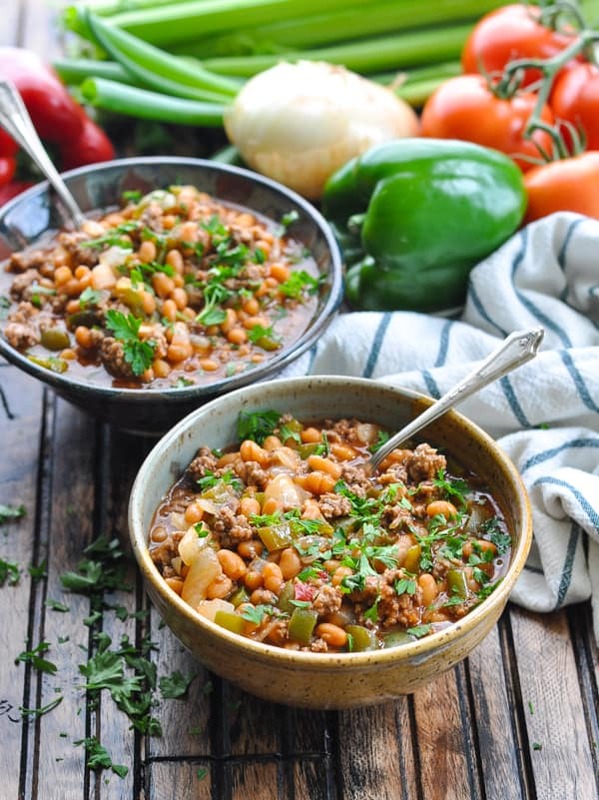 The easy dinner or potluck side dish is like a perfect cross between chili, baked beans, and a Sloppy Joe! 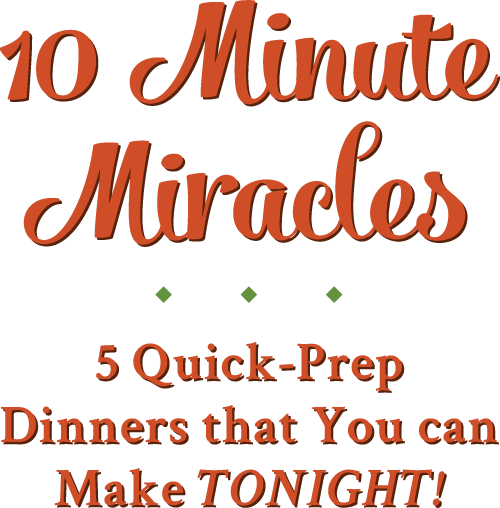 My friend Jackie told me about this recipe a few months ago when she was over at my house. It’s so easy that she just rattled off the ingredients by memory, as I jotted them down on a scrap of paper. 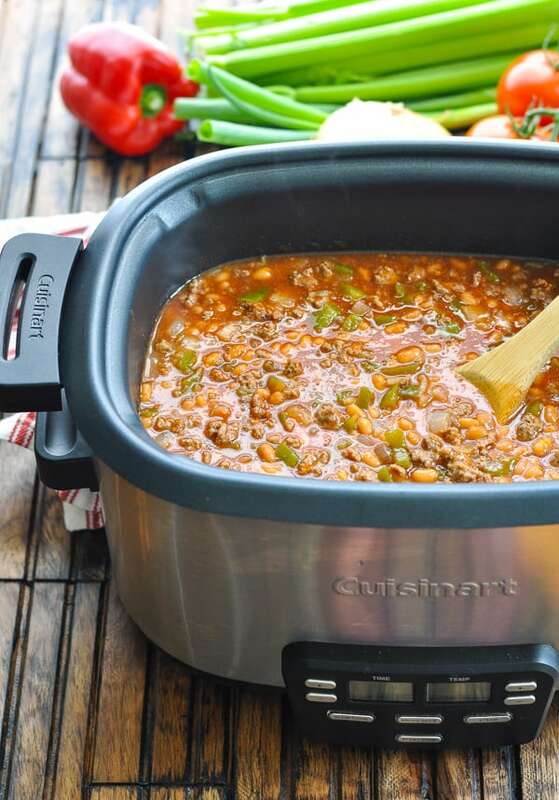 I knew that the combination of slow cooker bbq baked beans with ground beef and Manwich sauce was bound to be a winner with my crew! 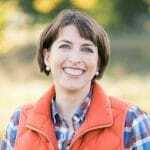 This is Jackie’s go-to potluck dish, which everyone in Madison has come to love and expect! 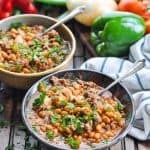 The pork and beans recipe works well as a crowd-pleasing side (kind of like slow cooker baked beans), or as an easy weeknight dinner. 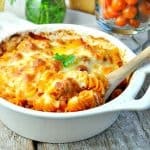 The ground beef is that extra filling, flavorful addition that turns it into a complete meal! How do you make Pork and Beans? 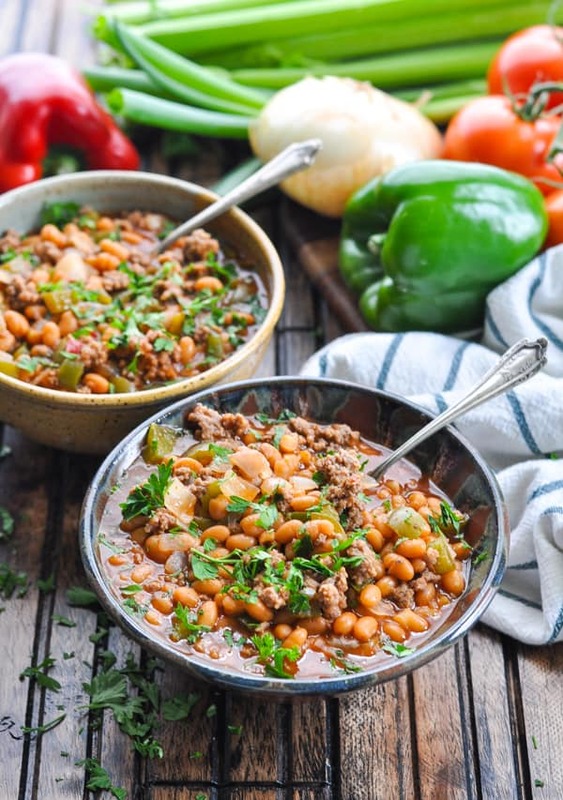 Jackie’s recipe requires just a handful of simple pantry staples — starting with the canned pork and beans! 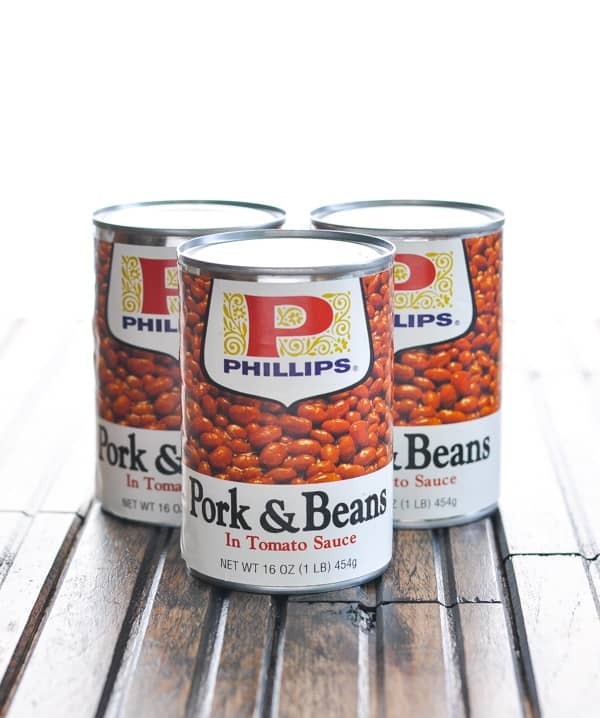 She insists that Phillips brand is the best, so when I told her that I wanted to try the recipe, Jackie brought over 3 cans of Phillips Pork and Beans for me to use! She stocks up and keeps them in her kitchen so that she always has the necessary ingredients ready to go. Of course, if you can’t find the Phillips brand in your neighborhood, you can use a different variety. Which Pork and Beans are gluten-free? If you need a gluten-free option, this website says that Van Kamp’s canned pork and beans are gluten-free, so that’s probably your best bet! 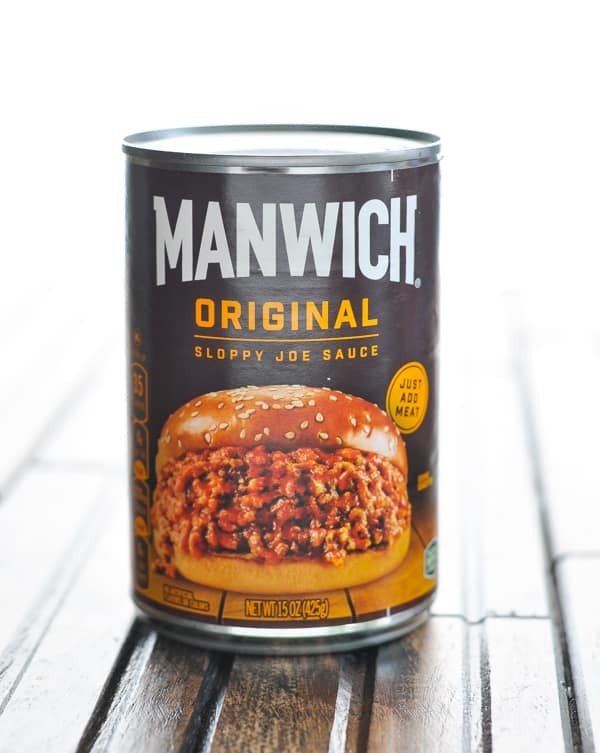 In addition to the three cans of Pork and Beans, you will also need a can of Manwich Original Sloppy Joe Sauce! 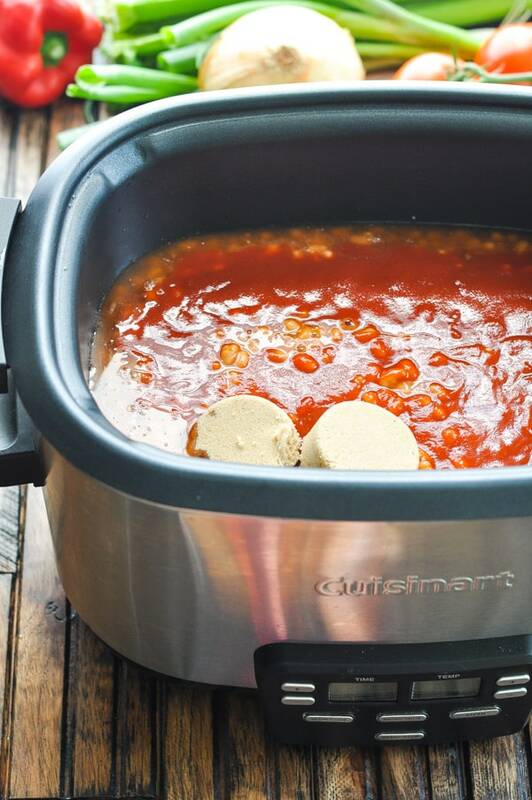 Place the pork and beans, the Manwich sauce, and 1/2 cup of light brown sugar in a slow cooker. So far, so good…right? 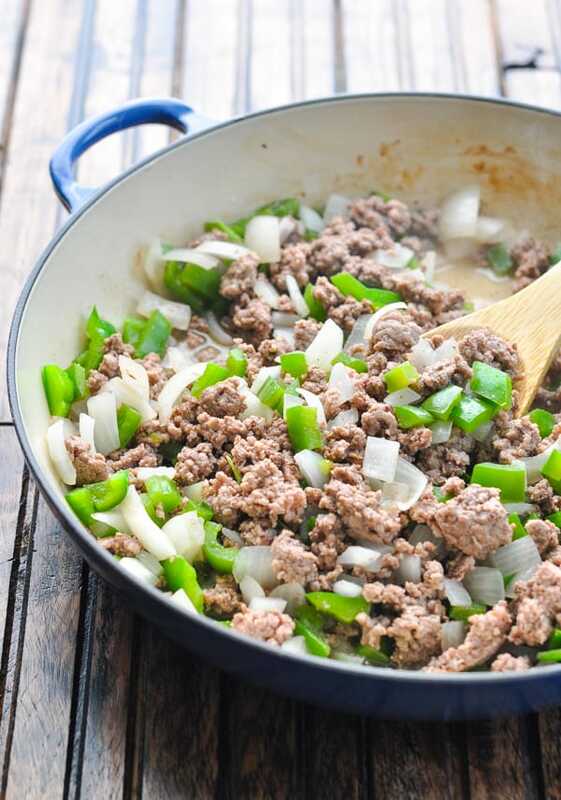 Next, brown the ground beef, green bell pepper, and onion in a large skillet until the meat is no longer pink. Drain. Add the beef mixture to the pork and beans in the slow cooker. Give everything a good stir, cover with the lid, and your job is done! Jackie suggests cooking the pork and beans on HIGH for the first 30 minutes, and then switching the temperature to LOW for another 1 hour. If you’re not going to be at home and you cannot switch the temperature after 30 minutes, you can cook your pork and beans on LOW for 2-3 hours or on HIGH for 1 hour. 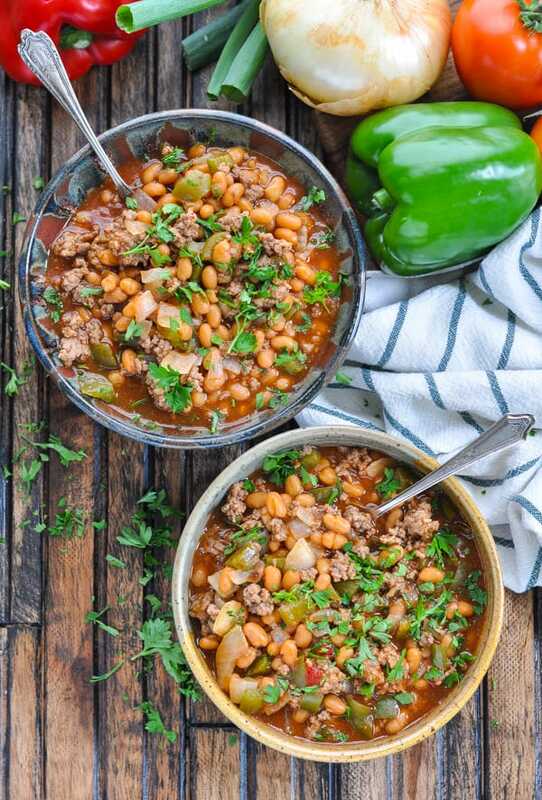 I serve this recipe for dinner to my chili-loving boys, and everyone is very happy. 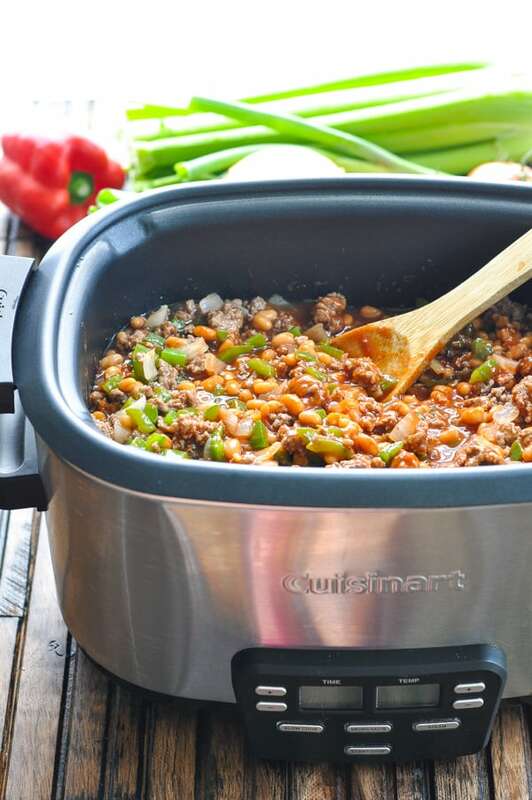 Add plenty of your favorite chili toppings, too! 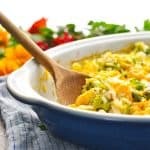 Shredded cheddar cheese, sour cream, sliced green onions, or just some chopped fresh parsley will all work well. What goes well with Pork and Beans? Place beans (with sauce), Manwich sauce, and brown sugar in the slow cooker. Brown ground beef, bell pepper, and onion in a skillet until no longer pink. Drain. 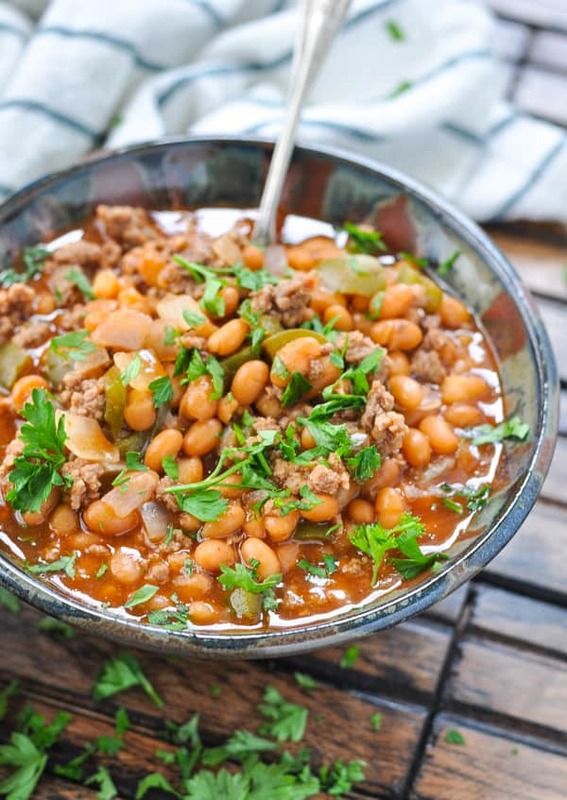 Transfer beef mixture to the slow cooker with the pork and beans. Stir to combine. Cover and cook on HIGH for 30 minutes; then switch to LOW for an additional 1 hour. 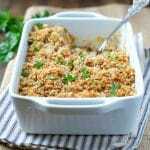 This dish works well as an entrée for an easy dinner, or as a side dish at a potluck. Jackie suggests cooking the pork and beans on HIGH for the first 30 minutes, and then switching the temperature to LOW for another 1 hour. If you're not going to be at home and you cannot switch the temperature after 30 minutes, you can cook your pork and beans on LOW for 2-3 hours or on HIGH for 1 hour. Hi sounds delicious! How long would these cook in the oven? Hi, Stephanie! I would say that you could try baking them (covered) at 350 degrees F for about 45 minutes – 1 hour, or until hot and bubbly! 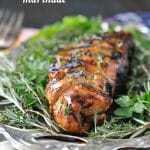 I was surprised to see that you used beef in a recipe called “Pork” and Beans!